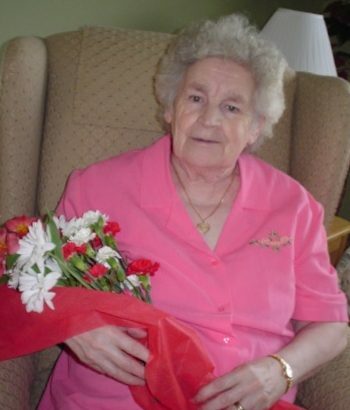 Passed peacefully away at the L.A Miller Center, Ellen Marie (Nellie ) Pinsent, aged 85 years. Predeceased by her husband Denis; daughter Josephine; parents Josephine and John; siblings Philomena, Theresa, Sylvester, Dennis and Ted. Leaving to mourn her children Elizabeth, Rosalynd (Hilles), Kathleen (Paul), Lorraine (Kurt), Denise (Curt), Gerard (Collette) and Cynthia (Sheldon); grandchildren Matthew, Cynthia, Keith, Shawn, Denis, Daniel, Nicole, Crystal, Jeremy, Lauralee, Emily, Matthew , Dylan, Alexandra, Denis, Katelyn and April; 14 great grandchildren; and son in law Alfred; also a number of other relatives and friends. The family would like to send a thank you to all the wonderful staff at the Health Science Center and the Miller Center who treated mom so kindly and with tender care. Resting at Sacred Heart Church in Bellevue on Saturday October 6 from 1- 2 p.m. Mass of Christian burial will take place at 2:30 p.m. with interment to follow in Sacred Heart Cemetery Bellevue. Flowers gratefully accepted or donations in Nellie’s memory made to the Children’s Wish foundation. Cynthia, I am so sorry to learn of your mother’s passing. She was a sweet lady and I missed seeing and talking to her when she moved from Tobin’s. My condolences to you and your family. Sending my deepest sympathy to all of Nellie’s family. to all nellies family I offer my sincere sympathy. She was one of a kind. I hope there is tv in heaven Nellie so you can watch your wrestling. Rest in peace. So sorry for your loss. Thinking of you all at this difficult time. So sorry to hear of your mom’s passing. It is always sad to lose a loved one but cherish her memory and know she is at peace. Our deepest sympathy to all of you. My condolences to you all.I have some very fond memories of your Mom and Dad.Your Mom will always be with you all in your hearts and your memories. Our Sincere Sympathy to you, Sheldon, Katelyn and April on the passing of your dear Mom. We know it is very difficult but may the pleasant memories you have shared be some comfort to you all. Condolences to Aunt Nellie’s Family. I remember her many visits to St. John’s growing up. She always made time to drop in to see our mother, Theresa. She was always so full of energy. She had a wonderful life and always spoke fondly of her children.